The Executive Chairman of Ojokoro Local Council Development Area, Hon. 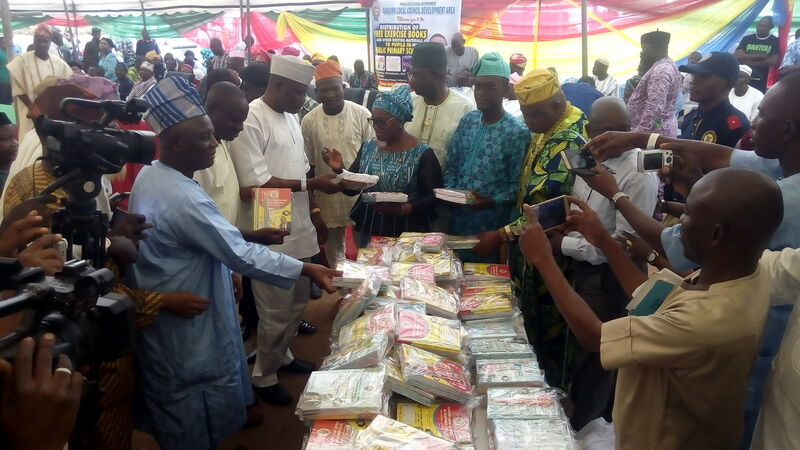 Hammed Idowu Daniel Tijani (HID) on Thursday 14th September, 2017 gave out free exercise books and other writing materials to the pupil of public primary schools in LCDA to facilitate learning and complement the efforts of the Lagos State Governor, Mr. Akinwunmi Ambode in ensuring Lagos pupils and students gets qualitative education. The event was graced by dignitaries, community leaders, party faithful and executives, religious leaders, students, parents, teachers and more at Agbado-Ijaiye Primary school in Salolo area of Ojokoro where the project was flagged-off. The Deputy Governor of Lagos State, Dr. Idiat Oluranti Adebule speaking through her representative Dr. Yinka Alayande appreciated Lagosians for the patience and believes in the administration of the Governor of the state, Mr. Akinwunmi Ambode and assured the people of continuous development. The Special Adviser to the Governor on Commerce, Hon. Benjamin Adeyemi Olabinjo told GOVTOROS that, the state government had spent billions of naira to renovate and build new blocks of classroom and provision of facilities for effective learning while the students were on break. He stated further, “what is happening today is a step in the right direction because the chairman (HID) is complementing the efforts of His Excellency and I am happy with that”. The council boss, Hon. HID Tijani said this is a way of fulfilling part of our electioneering promises because we promised qualitative education and it is not going to end here. “Our educational projects and programmes is not just donation of books and writing materials, we have already and are still meeting with several agencies and NGOs for partnership so as to do more for our wards and we are already getting positive fillers”, he said. Hon. Akiwunmi Nurudeen Olaitan advised the students to make judicious use of the materials given to them and urged parent to wake up to their responsibilities in child upbringing and parenting. 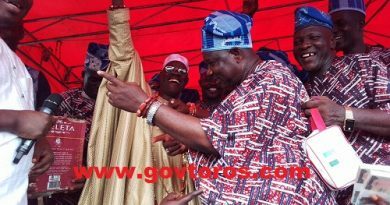 The Leader of Ojokoro Legislative Arms, Hon. Abdulazziz Osho speaking with GOVTORS said, “this is just a tip of the iceberg in areas of development which the good people of Ojokoro will enjoy under the present administration led by Hon. Hammed Idowu D. Tijani (HID) because several resolutions has been passed by the Honorable members of the house for the comfortability of our people, and I want to assure you that quite a number of them will also be implemented in due time”. Other members of the council legislative arms present include Hon. Adeniji Segun, Hon. Femi Oke, Hon. Olootu Emmanuel, Hon. Adeyoola , Hon. Dauda Morufand Hon. Tunde Oyekunle. OMG! The Best STAR HAJJ PACKAGES WITH FLIGHTS Ever! Thanks a lot for sharing this with all of us you really recognize what you are speaking about! Bookmarked. Kindly additionally seek advice from my web site =). We could have a hyperlink exchange agreement among us! Canon comes with the exceptionally best range of printers and drivers, which enables the consumers to experiences world-class quality printouts. The products by Canon are responsible for the world-class quality of prints and color they give on the image. As the ink used in the printer is of the best of quality and could not be compared. The reason behind this is the utilization of parts of printers that are commendable and much updated as per today’s technology. Experts at Canon Printer Support give services that stand apart from the rest of the printers available in the market. Also, Canon Support has faith in the quality of the product that is produced. Hi there, I discovered your website by way of Google while searching for a similar topic, your site got here up, it appears to be like great. I’ve bookmarked it in my google bookmarks. Thank you for any other fantastic article. The place else may just anybody get that type of information in such a perfect means of writing? I’ve a presentation subsequent week, and I am at the look for such information. Thanks for any other informative website. Where else may just I get that type of info written in such an ideal approach? I’ve a challenge that I’m simply now working on, and I’ve been at the glance out for such information. Wow, superb blog layout! How long have you ever been blogging for? you make blogging look easy. The whole glance of your site is magnificent, as well as the content!